Figure 1. A view of the chemical structure of glucosamine. Figure 2. Structure of Glycosaminoglycans: A schematic figure of cartilage, where the fine hair-like branches are glycosaminoglycans, which are made up in part by Glucosamine. Figure 3. Osteoarthritis of the right hip. 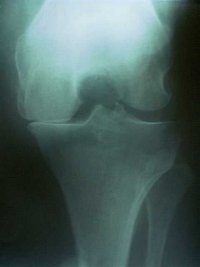 Osteoarthritic changes of the right hip shown on x-ray include loss of joint space, sclerosis and osteophytes. Figure 4. Osteoarthritis of the hand. Radiologic features of advanced osteoarthritis of the fingers.